Some comments about The Project. I was going to put a few comments here, because although they are placed on the side bar over there, a lot of people still miss them. I’d advise you to have a look to gauge the general feeling of people, both here and in the US. But, I received a comment a few hours back that I think is straightforward, pithy, and so very well written with lovely snatches of humour that it deserves a platform all of its own. I’ve spent a lot of time around the project, looking over the walls nearly everyday; and I for one can’t understand these random side steps in progression with this project. If it’s failing, just admit it’s failing. Every article for the last 4 years covering this “community project” has shown it to be some god awful parody of what it perceives itself to be, some nautical historical disney land. where as the truth can only be described as “Carry on across the Atlantic”. Everything that goes slightly off target with it just gets the official response of “tis but a scratch” even though it’s had its arms chopped off and is standing on stumps, (don’t worry it’s official mayflower oak stumps, felled from the most holy of oak trees). The loss of charity status may not detriment it’s laughable income in donations from across the pond, but it does effect it’s status on the global stage as an “official” charity that wants to take place in these global 400 year anniversary celebrations that should be bigger than all of the olympics and world cup games put together, according to my last tour. I only want this project to seriously succeed so that when or if The Donald ever steps foot on it; I can at least watch them both sink together knowing that our backwater little town actually did something positive for the world. If anyone from HMP is reading this, perhaps it’s time you stop sniffing wood glue, you’re clearly more high than your neighbours in bathside. EDITORIAL COMMENT: This blog does not condone the sniffing of wood glue, or any other substances used to fix wood together. We might like a drink now and again on a Friday night, and maybe a bag of pork scratchings, but that’s where we draw the line… OK there was that one time when someone said I could get a buzz from licking a frog, but I’m not counting that. 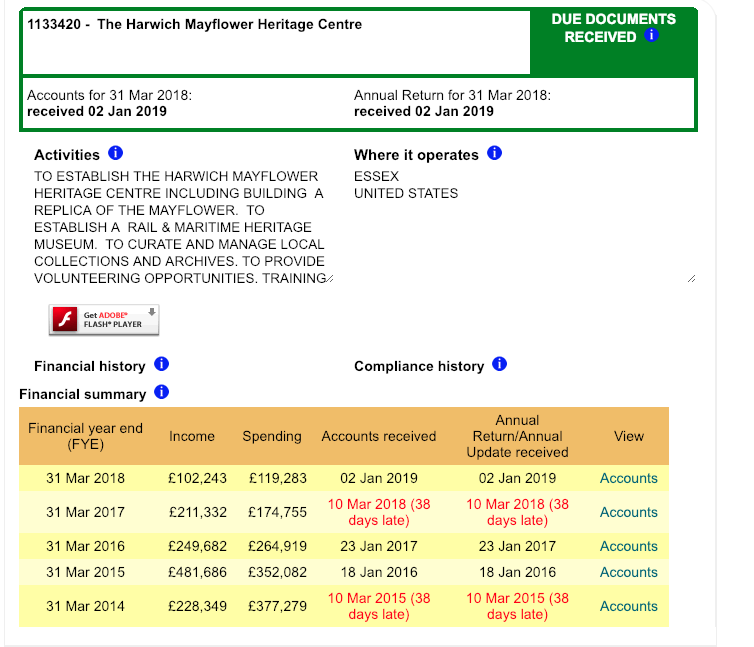 Harwich Mayflower Project wins the cup! Today the Harwich Mayflower project had a stand at the local county fair. The Tendring show is an agricultural event that takes place every year and attracts in the region of 25,000 visitors in a day. The Mayflower Project was promoting itself and trying to raise awareness within the local community about what it does. Several of the staff as well as trustees and the Chairman, Tom Daly, were there. The shipwrights were working on a piece of oak, while everyone else was handing out leaflets and talking to visitors about the Project. There were various competitions run throughout the day and lots of ribbons were awarded. In fact, the Mayflower Project won first prize in the ‘Best Charity Stand’ category. Apart from a ribbon, they got a cup, which Tom Daly received on behalf of everyone at the Project. As usual I took hundreds of photos and a small sample are below. The images under the main photograph are a gallery, clicking on any one of them will open a slideshow for you. Photography and content: James Kelly. 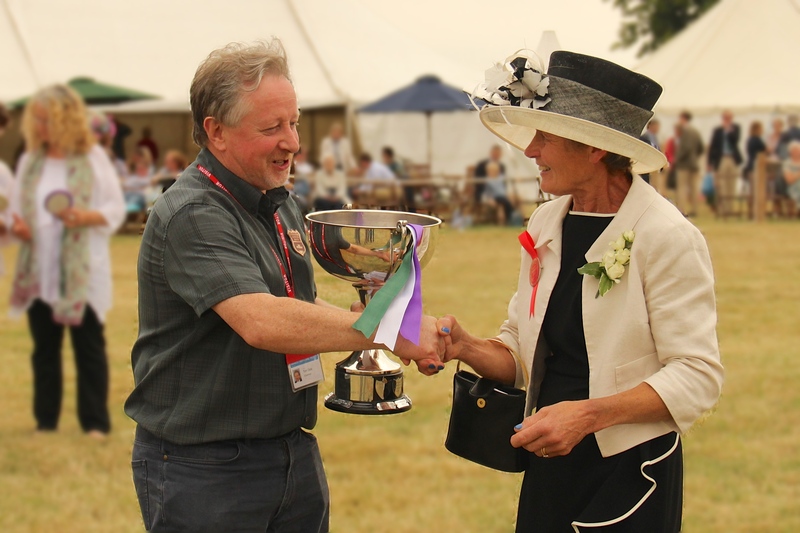 Tom Daly receives the Ford Cup from Tendring Show president, Judy King.